Last week I posted my Birthday In a Jar gift and it made me think about how many other gift in a jar ideas are out there. Pinterest has a fun array of ideas so I am bringing you 18 of the best that I found. Enjoy! Take a look at all of these and try to decide with one is your favorite. You will probably have a hard time choosing…just like me. These are not in order but there are a few from the same website. Geez people make cute stuff! Be sure to check out their posts for all of the supplies and the “stuff” that went into the jars. 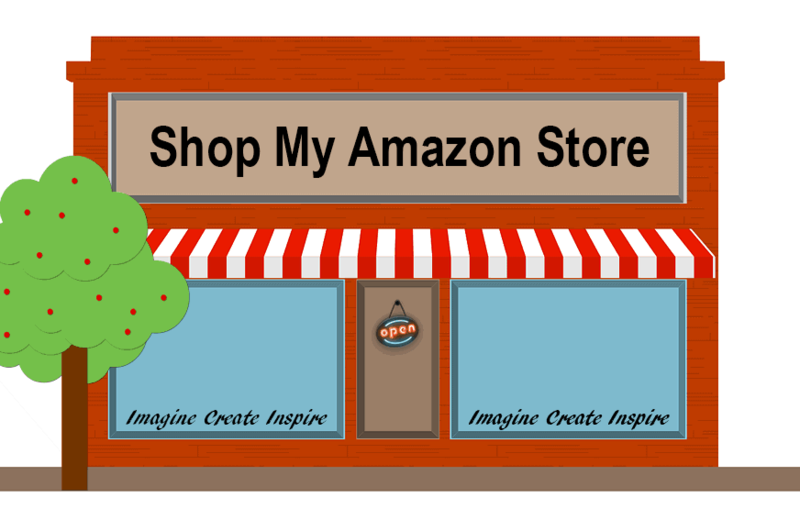 Plus some of them have free printables so you can create the same tags and stickers. 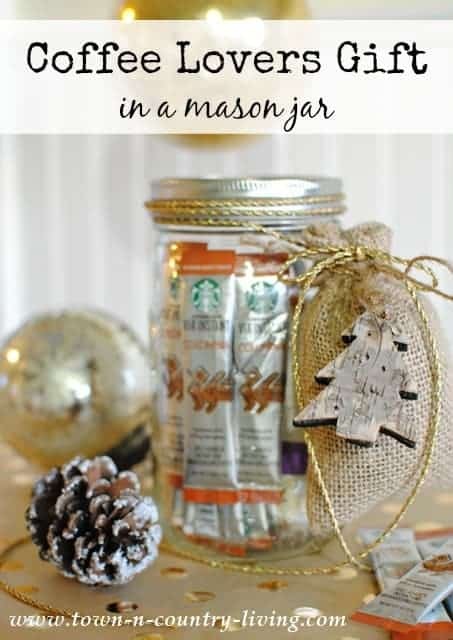 The Coffee Lovers Gift In A Jar – This one looks like it was a Christmas gift but it would be fun any time of the year. Replace the tree tag for a tag with a sentiment and you are all set to go! 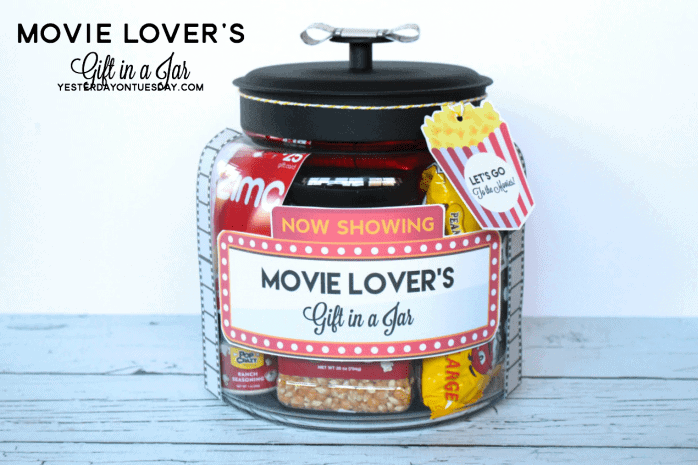 Movie Lovers Gift In A Jar – This is definitely one of my favorites. Jeff and I love movies. Before I spent so much time blogging we used to go quite often. LOL! We still go a lot and we like to watch at home too. Look at all of the goodies in this jar! I love the larger jars too. A few of these ideas are using them. 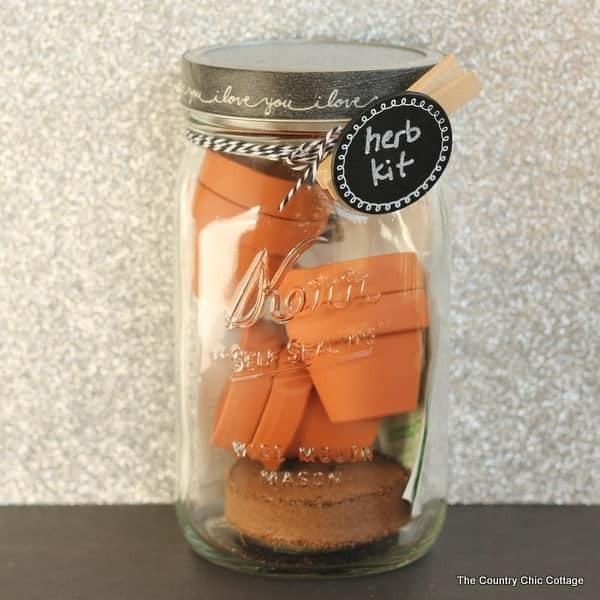 Herb Kit In A Jar – How cute are these little pots and all of the fixin’s for an herb kit. It is so perfect for a gardener or a great cook. 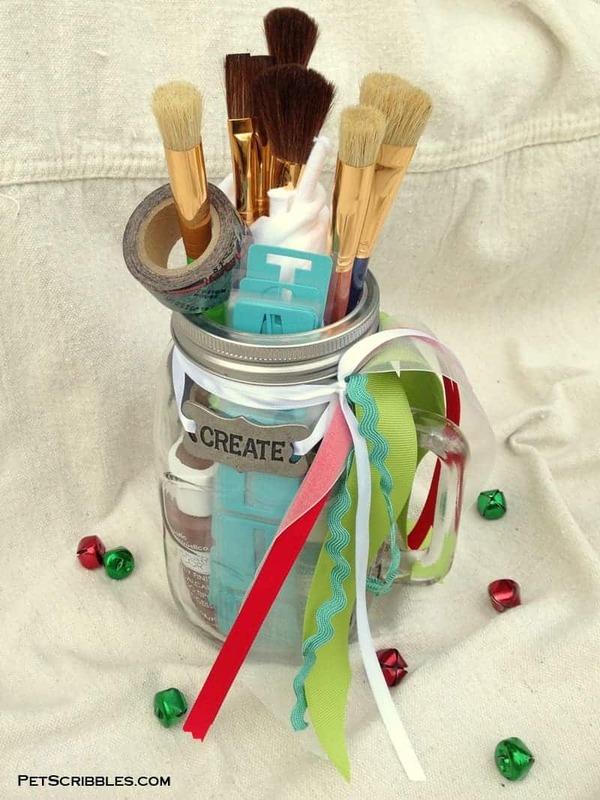 Painter’s Gift In A Jar – I would have never thought of this but it is brilliant. I would LOVE this and I think I know so many other people who would love it too. The brushes and stencils and paints are all things people like me use and use often. I also love that her blog is called Pet Scribbles and she not only writes about crafty things but her cats too. I think we have a lot in common! 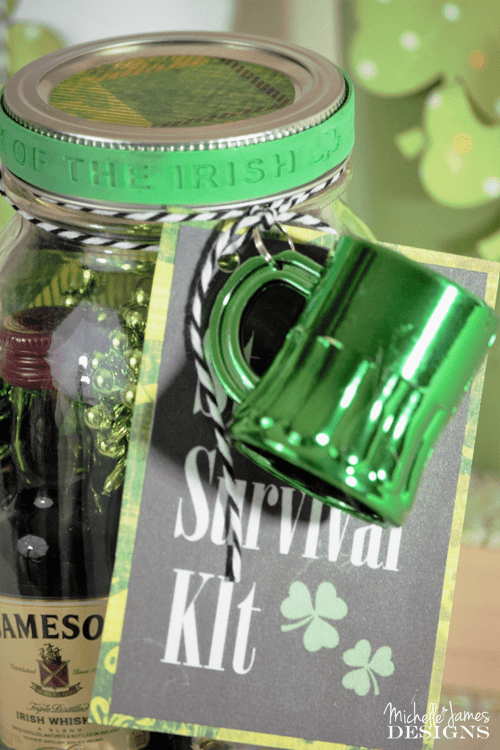 St. Patrick’s Day Survival Kit – I created this last year. It was cold during the parade so I thought I would help people keep warm and stay festive. You can read my post here! 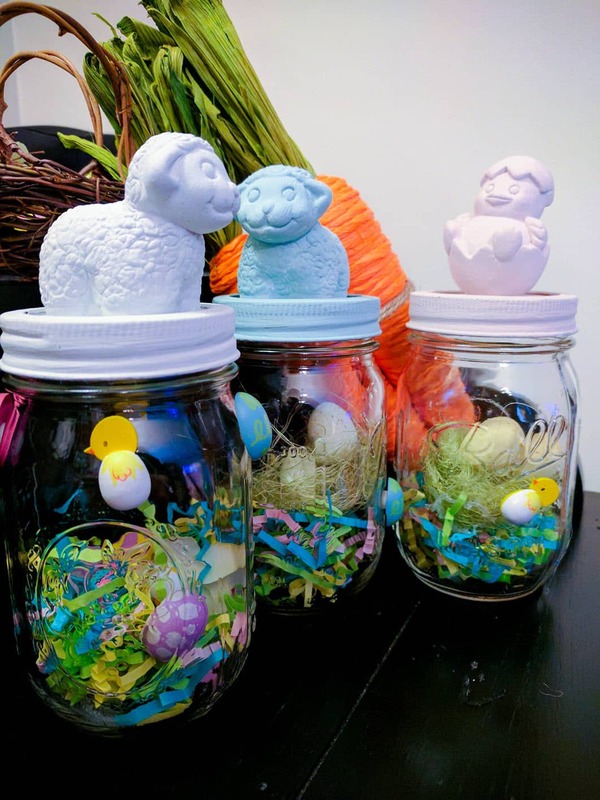 Easter In A Jar – These little Easter gifts take jar gifts to a new level by adding an entire element onto the lid. How cute are these? 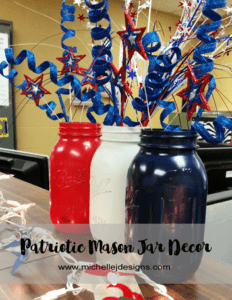 You have to head over to Sassy Townhouse Living and see how she made these. ADORABLE! 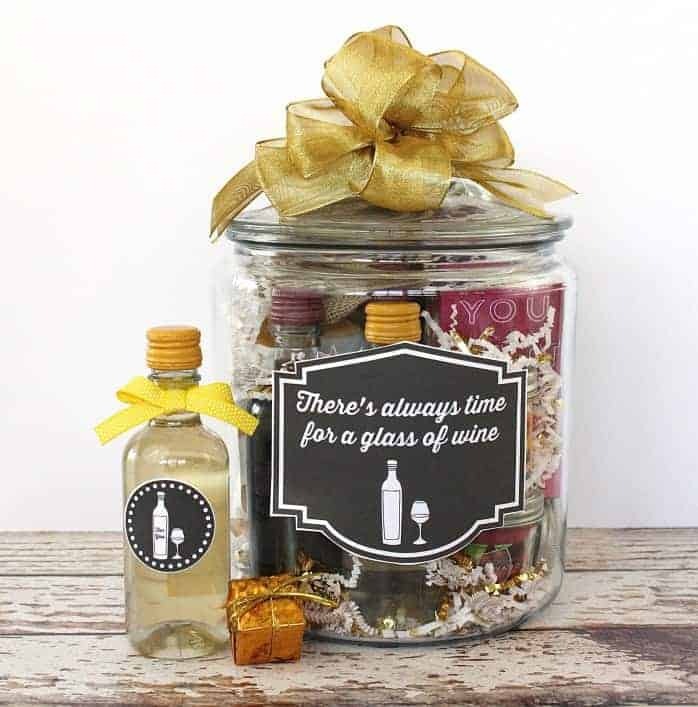 Wine Lovers Gift In A Jar – Uh….yum! This is awesome. It includes a couple single serving wine bottles, some wine themed products from Bath and Body and a cute little handmade bag that includes wine charms and a wine stopper! Plus there are printable available too. This is the best! 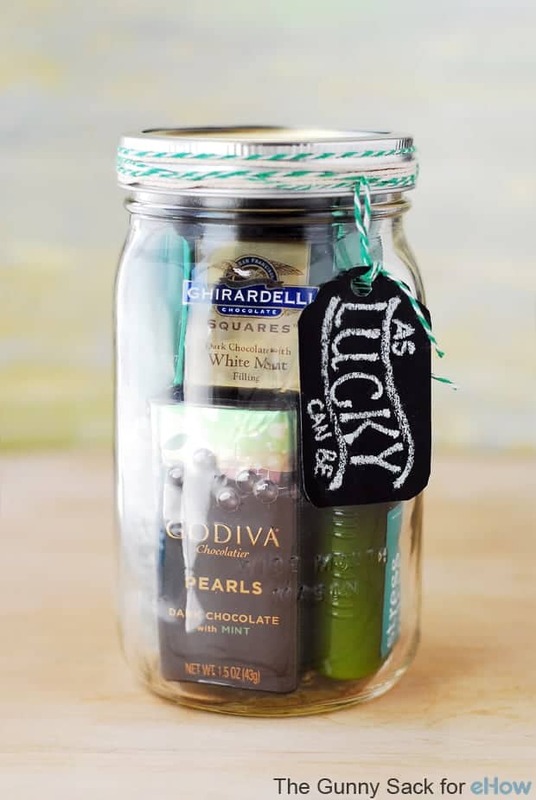 Lucky St. Patrick’s Day Gift In A Jar – The first thing I see in this gift in a jar is the Ghirardelli chocolate squares. That is enough for me right there! But it looks like there is a lot more and a cute tag to boot! 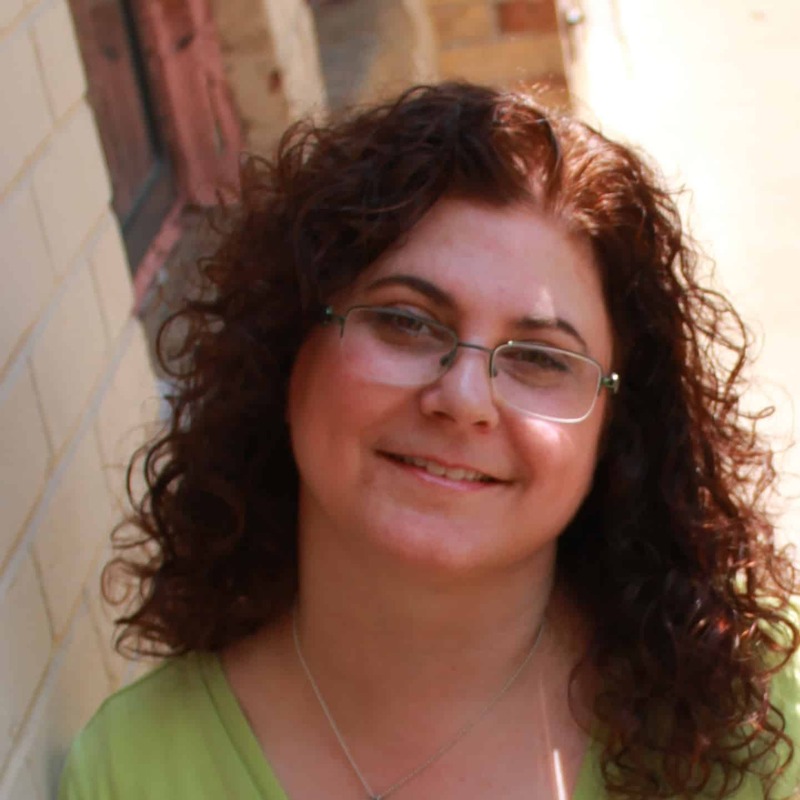 This post was created by The Gunny Sack for EHow but I am linking to The Gunny Sack. You may have to click one more time from her blog to get to the full tutorial but it is worth it! 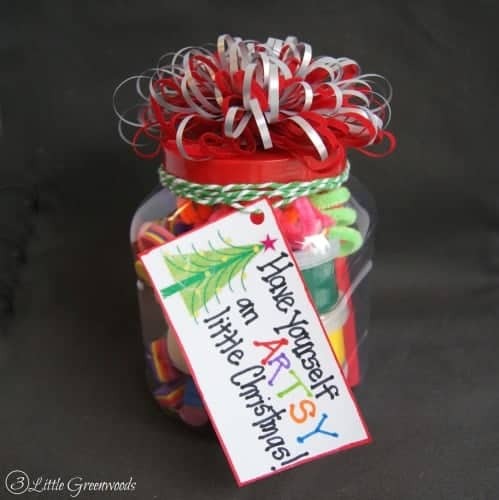 Artist’s Gift In A Jar – All of the supplies for this including the plastic jar container was found at the dollar store and was specifically created for a child to give to another child. So a plastic jar filled with all sorts of kid friendly and fun artists supplies is perfect for a day of crafting. I think many children in the midwest would have loved to do some crafting on the snow days home from school and we had a lot this year. Check out all of the supplies she got on her blog! 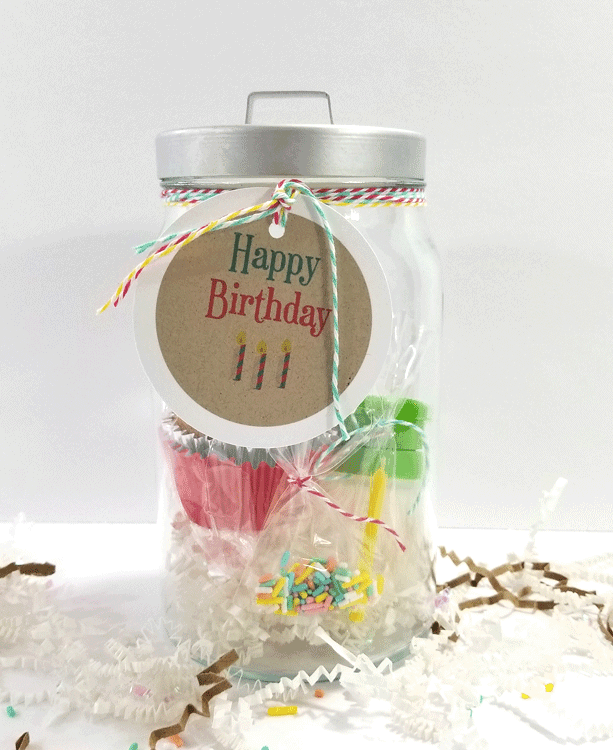 Birthday In A Jar – This is the post I shared recently right here on Michelle James Designs. It includes a cupcake, frosting, sprinkles and a candle so the recipient can have his or her own, little celebration! You can read the post here! I have included a free printable as well. 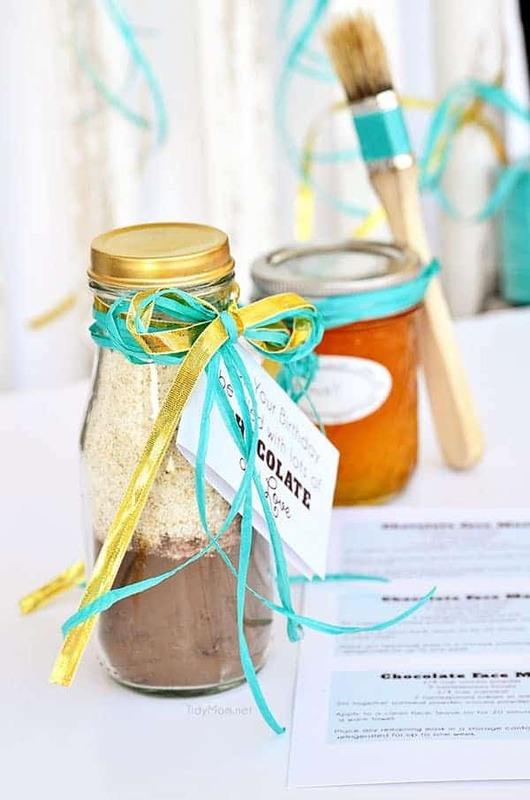 Facial In a Jar – How would you love a chocolate face mask in a jar and the recipe? I just love everything about this and the packaging is perfection. 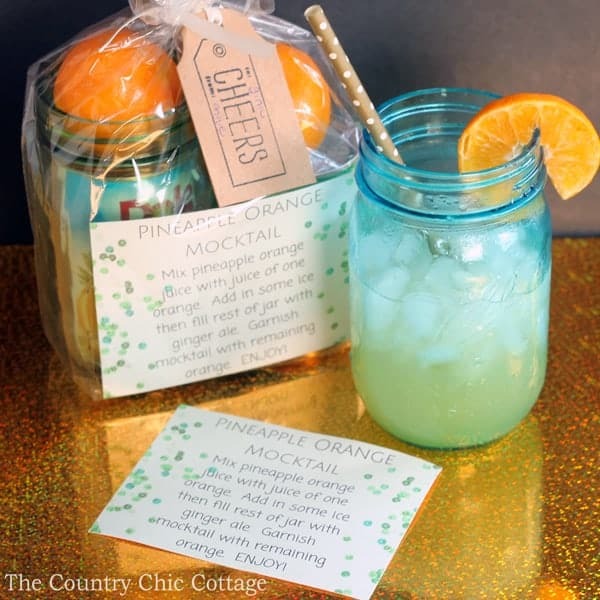 Mocktail Gift In A Jar – A perfect gift for a pregnant mom or just someone who prefers not to drink Angie does say you could add a small bottle of alcohol to create a Cocktail Gift In A Jar if you prefer. I love the way it all looks put together. What a great gift! Rosemary Focaccia Bread In A Jar – Okay, I was really trying to avoid the recipes in a jar for this post. That could be an entire post on its own but when I saw this rosemary focaccia bread I thought it was so interesting and different I had to include it. It looks so pretty in the jar, of course but I think the bread would be amazing! 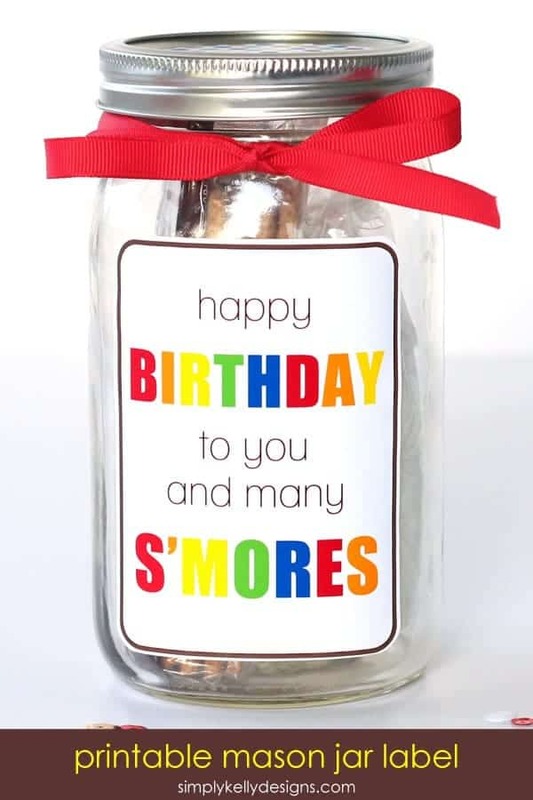 Birthday S’Mores In A Jar – I think this would be absolutely perfect for someone with a summer birthday so they could put them together over a real campfire. The sticker is so festive (and a printable) plus the s’mores are as good as a piece of cake! 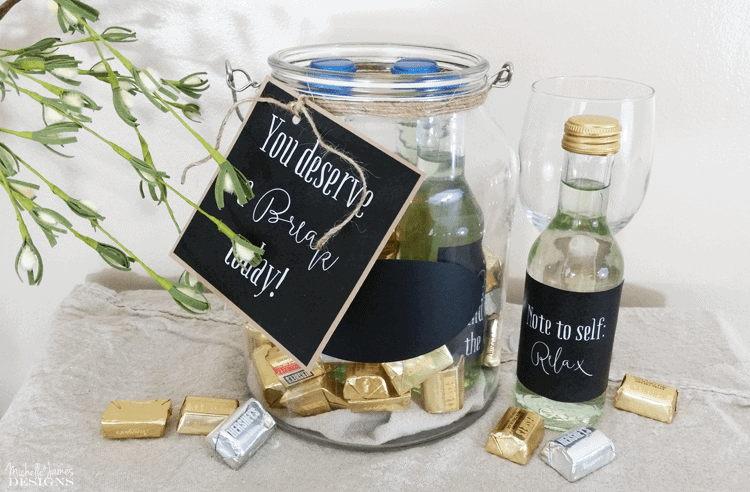 Relax And Take A Break Gift In A Jar – I love this even if I do say so myself. I gave two of these as gifts a couple of years ago and they were very well deserved and received. Do you know some one who is going through a rough patch right now and just needs to sit back, relax and have a little break? This gift is for that person. I recently added these mini wine bottle labels to my Etsy shop too. But you can find them here on my site as well! 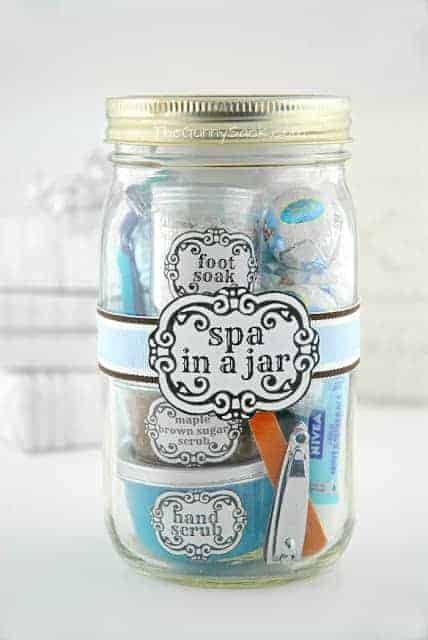 Spa Gift In A Jar – There are all sorts of goodies in this jar including lotion, hand scrub, and emery board and much more. And she made everything match with a blue theme. That makes it so fun. She has the printables for the little labels too. 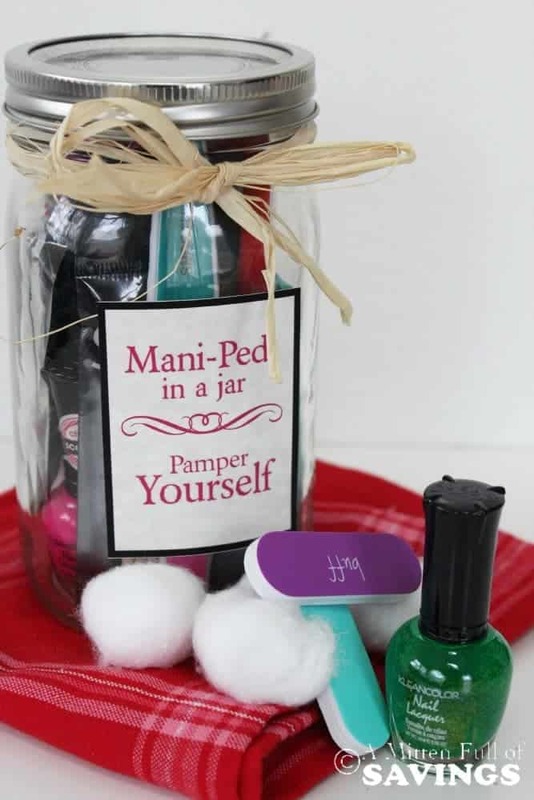 Mani/Pedi Gift In A Jar – Along the same lines as the spa in a jar this is a mani/pedi gift. It includes some polish and other great products for the perfect “at home” manicure and pedicure! I love it! 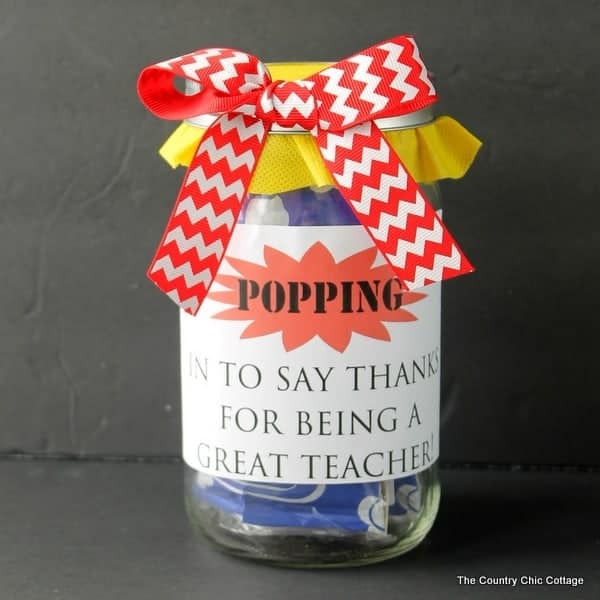 Popcorn Teacher Gift In A Jar – And last but certainly not least is a terrific teacher gift. We can’t forget our teachers can we? They do so much for our children and here in our town, many of them are my friends too. They should get gifts too. This one is so cute, “Popping in to say thanks for being a great teacher” . It is true and they can take the popcorn home and share it with their families. Whew! There we go. 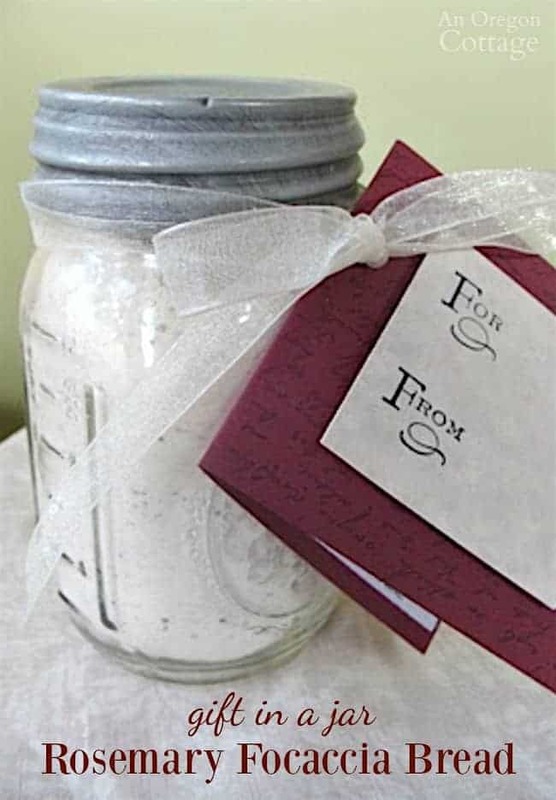 Eighteen fabulous gift in a jar ideas that can use or get inspiration to create your own themed gift in a jar. The possibilities are endless. If you would like to make your own gift in a jar I have added some fun jars and even some chalkboard labels to my Amazon Store! Take a peek! This is such a nice collection of gifts in a jar. dont make me pick a favoritebut if i must, it might be movie gift in a jar or easter in a jar. Hi Sue. I love both of those. It is really hard to pick a favorite!